Britain has an ageing population and this demographic change is good news – a mark of our improving living conditions, diet and medical advances. But without radical change we face an old age of increasing polarisation, suffering and loneliness. It is for this reason we are calling on Government to appoint a Minister for Older People in the Cabinet who can lead the cross-departmental approach, as well as a Commissioner for Older People to champion older people’s needs. 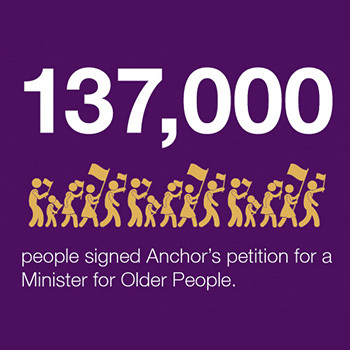 137,000 people have signed our petition showing there is public demand. We already have cross-party support for a Minister and so we are approaching politicians to highlight the needs for a Commissioner and Minister for Older People. This manifesto highlights major areas of concern; which can only be addressed properly if the Government appoints a Minister for Older People. At present, issues are spread over different Government departments, with no adequate joined-up working. Read more about these major areas of concern and what we believe should happen in response. Nowhere does the impact of demographic change play out more vividly than in the health service, where two-thirds of hospital patients are over the retirement age. 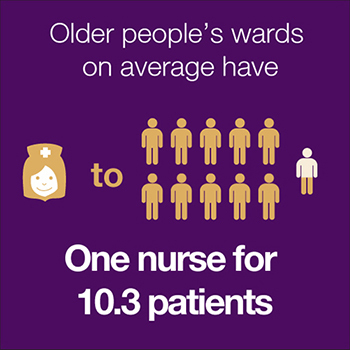 Older people’s wards regularly average fewer nurses per patient than the Royal College of Nursing considers necessary for basic safe care. Less than half of registered nurses thought health care assistants had the training they needed to care for older people. Too little is done to prevent conditions from worsening. Increase the number of staff on older people’s wards in line with Royal College of Nursing guidance. Assessments for frailty and risk of falls, in line with expert guidance. Appoint a Commissioner for Older People who would investigate, among other issues, poor health care experienced by older people. The supply of appropriate housing for older people is woefully inadequate. A third of over 60s want to downsize. 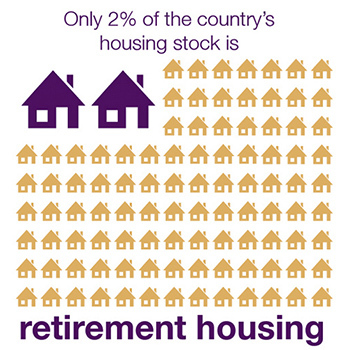 50% of the over 60s who wanted to move said they couldn’t because of a lack of supply of retirement property. 60% of household growth through to 2033 will involve someone over 65. A national task force of developers, ministers and local government to produce a national strategy for increasing supply. Create a level playing field for retirement housing developers. Ensure all local authorities have a robust housing strategy for older people and act on it. Few will deny that social care is in crisis. Demographic change means it is likely to worsen. Spending on social care for older adults fell by 15% between 2009/10 and 2012/13. 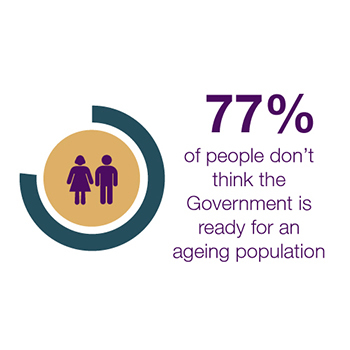 24% Britons are unaware the Government does not fully fund social care for older people. 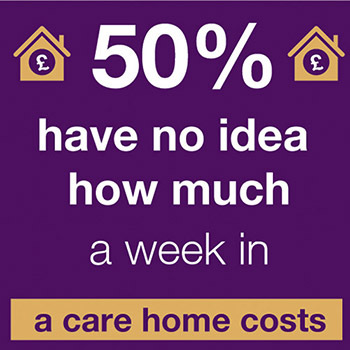 Most people will have to spend up to £140,000 on care costs before costs are capped. Extend worksave pension scheme to include additional saving for social care. All providers receiving adequate State funding be required to pay the proper living wage as set by the Living Wage Foundation to all care home and domiciliary carers and activity co-ordinators. Short-term thinking exacerbates the dysfunctional relationship between health, housing and care. In 2012-13, patients spent 833,000 days longer in hospital than necessary because of delayed transfers. 50% of medics said delayed transfers were worse now than a year ago. 57% of older people living in care homes do not have access to all the NHS services that they may require. Fully integrate health and care. Clear guidance to Health and Wellbeing Boards explaining their remits and ensure housing plays a significant role. Abolish retainer fees charged to care homes by GPs. Older people face a disproportionately high incidence of fatalities or injuries caused by road accidents, falls on pavements or while using public transport. Older people are more likely to be killed or suffer a serious injury as a result of a road accident than a younger person. An estimated 2,300 older people fall on broken pavements every day. The majority of over 70 year olds state that ‘personal security in the evening and at night’ is a barrier to using public transport. Fines should be introduced if local authorities or the Highways Agency fail to maintain unobstructed views at accident black spots. Adequate funding to maintain pavements. Transport operators give “old age” the same prominence as “disability”. Ageism is rife in the workplace and aspirations for a fulfilling, active retirement while leaving a nest egg for the kids may not tally with reality. 41% of young people say there are not enough jobs for older people to be in work. Out of 10.2 million people aged between 50 and the State Pension age, 2.9 million (28%) are out of work. England could face a shortfall of 718,000 care workers by 2025. Businesses should perform an ‘age friendly’ audit to identify how well they are meeting older customers’ needs. Businesses required to provide more flexible working for older people so they can juggle the responsibilities in their private life and at work. Introduce apprenticeships and retraining programmes to enable older people to continue working or to re-join the workforce. While the internet offers many opportunities – it is not a panacea. 70% of 65 year olds and over in the UK are digitally excluded. Digital exclusion prevents access to money saving deals, information about wellbeing and employment and opportunities for social interaction. 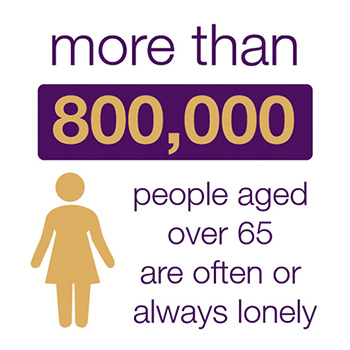 All services used by older people should be accessible off-line, as well as on-line. The Commissioner for Older People, once appointed, should assess whether they are. Businesses and organisations should be encouraged to think about how people who are not online can still access their services and how to make this information readily available. All British companies should sign up to the international standard for web accessibility set out by the World Wide Web Consortium and the Web Accessibility Initiative.